Though relatively young in the grand scheme of stained glass history, the Studio, in its more than 125 years of dedication to the craft, has contributed to the art glass heritage of America through both creation and conservation. 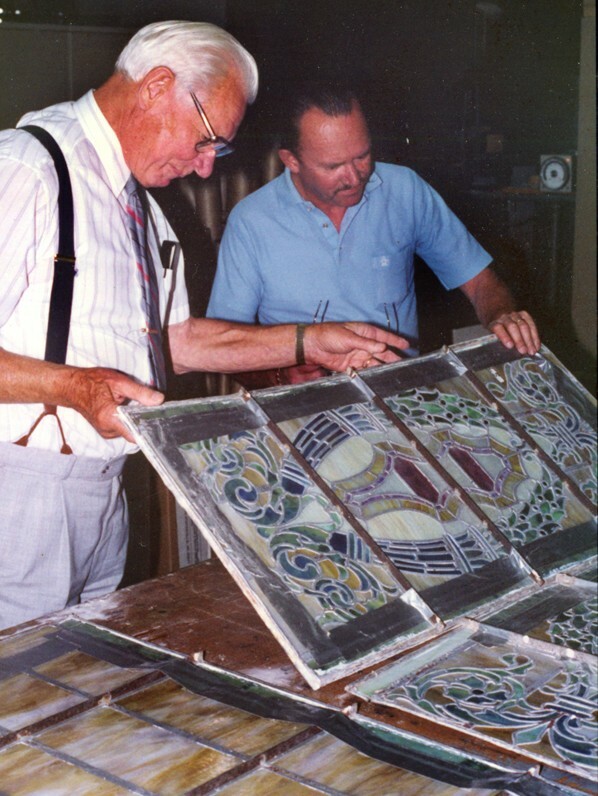 In addition to new stained glass designs, Conrad Schmitt’s artisans conserve and restore thousands of square feet of stained glass each year, including priceless windows by John La Farge, Louis Comfort Tiffany and Mayer of Munich. These meticulous projects are conducted with utmost care for the significance of the artwork. The approach to a stained glass conservation or restoration project differs from that of a new glass project. It is influenced by the history of the artwork, the artistic significance, the materials used, the budget and the client’s needs. Decisions regarding the approach must be made on a case-by-case basis, guided by the conservator’s experience, sensitivity and skill in this specialized field. Window audits can be conducted initially to generate recommendations regarding conservation, restoration and thermal protection. An extensive process of examination and documentation begins each conservation and restoration project. The windows are studied and photographed in place, followed by comprehensive written and photographic documentation in the Studio. Rubbings on acid-free vellum record exact measurements, as well as every nuance of the glass and leading texture. The preservation community today prefers conservation over restoration. The primary difference is that window conservation involves saving every piece of glass except those that are beyond repair. Cracked glass is either repaired with conservation mending leads or edge-glued with conservation epoxy or silicone that has been tinted to match, thus minimizing the appearance of cracks. Stained glass restoration entails returning the stained glass to its original appearance. Broken glass is matched and replaced, glass painting is replicated, and the kiln firing is duplicated. 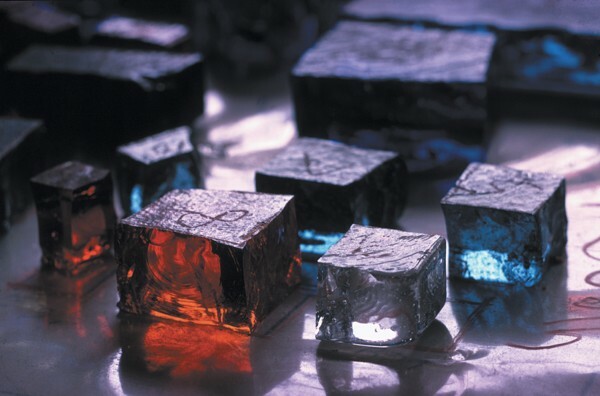 For missing glass in both procedures, research is conducted to identify its design and coloration for reproduction. The results from the conservation and restoration of a window are dramatic, as the artwork is completely rejuvenated. For important information regarding the safeguarding of your sacred artwork, see our new Stained Glass Appraisal Guidelines Booklet. Watch the video for a view of Conrad Schmitt Studios’ restoration of Union Station in St. Louis, Missouri and the Paramount Theatre in Boston. Traditional and Medieval stained glass are similar only in the fact that every piece of glass is painted and fired with grisaille. Aside from that common characteristic, the two are very different in style. 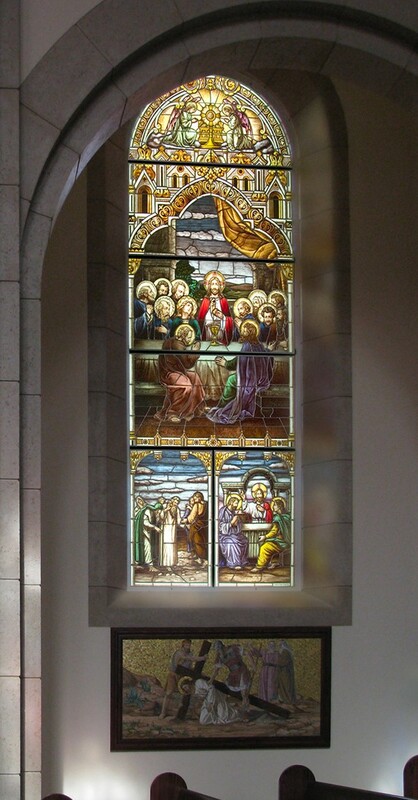 Traditional stained glass has become popularized by early turn-of-the century glass produced by Franz Mayer of Mayer of Munich, Inc. and his brothers of the Innsbruck Studios. Conrad Schmitt Studios has perfected the process of producing turn-of-the century traditional stained glass through thousands of hours of replicating and restoring stained glass windows. Today, original Gustave Doré‘s biblical designs are produced in new stained glass windows through the use of mouth-blown stained glass and hand painting, including flesh tones with up to ten firings on one face. Silver nitrate is used on the back side of the glass to create the golden hallows and other accents. Medieval glass can be found in prominent Cathedrals such as the Chartres Cathedral in France and the Canterbury Cathedral in England. 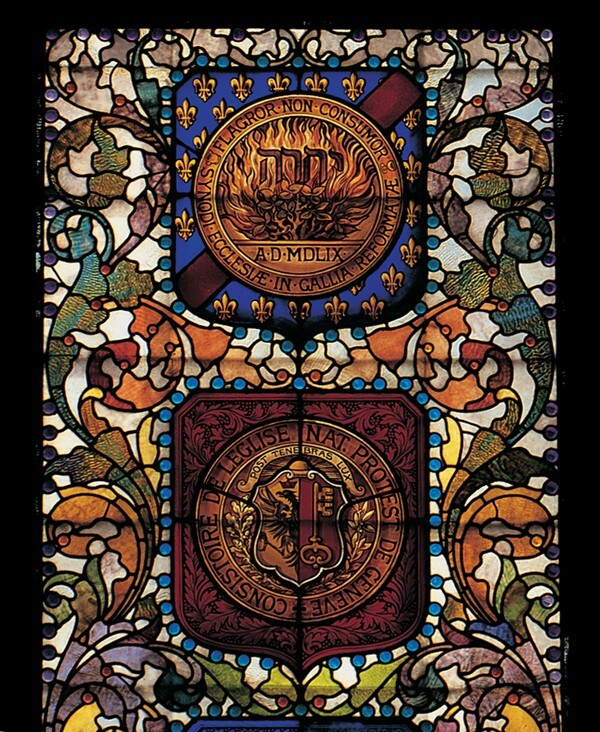 The American studio of Charles Connick was one of the greatest producers of medieval-styled stained glass during the early 1900s. At that same time, Conrad Schmitt Studios and many others replicated the medieval style. Patterned glass can make a plain opening appear classically decorated. Patterned glass can be as simple as repeating squares, circles or diamonds or it can be embellished with grisaille paint. Historically, patterned glass had been used as a background with strategically placed symbols. However, in the United States around the turn of the century, patterned glass became a quick, temporary, less expensive option to installing the final stained glass windows. While being the most cost effective and least labor intensive style of glass, it is one of the most beautiful. Tiffany-styled stained glass often contains intricately cut opaque or opalescent glass, overlaid with wide varieties in thickness. The glass is selected for its color and the use of the colored glass itself creates the stained glass pictures. This is contrasted with the method of painting in glass paint or enamels on colorless glass that had been the dominant method of creating stained glass for several hundred years in Europe. In the beginning of Tiffany’s career, he used cheap jelly jars and bottles because they had the mineral impurities that finer glass lacked. When he was unable to convince fine glassmakers to leave the impurities in, he began making his own glass using opalescent glass in a variety of colors and textures to create a unique new American style of stained glass. The Conrad Schmitt Studios prides itself on its ability to create Tiffany-styled stained glass windows, drawing upon its vast experience and its glass palette from the Studios’ special collection of Tiffany glass as well as that from various specialty suppliers. The style calls for matching century-old-glass and often joining the glass with copper foil rather than lead cames. CSS also conserves countless windows by Tiffany and similar multi-layered and intricatly designed windows by John La Farge, Mayer of Munich, McCully & Miles and others. New contemporary, abstract or modern stained glass can be constructed in a traditional manner or a single pane of glass can be painted on as if it was one large piece of canvas. Any design, multicolor layers, shading and blending can be accomplished with glass pigments and fired for 100% permanency. This new style of glass can be found in museums throughout the world and is rising in popularity in the architectural art glass field. A relative of traditional stained glass, the faceted style, also known as Dalle de Verre, employs thick slabs of colored glass set into epoxy rather than lead cames. Its appearance is often reminiscent of mosaic, but unlike mosaic, the glass jewels glow with light-filled color. This more impressionistic type of window recalls the early glass fabrication of the Persians and Saracens, in which thick, crude glass was set into wood, stucco or stone. 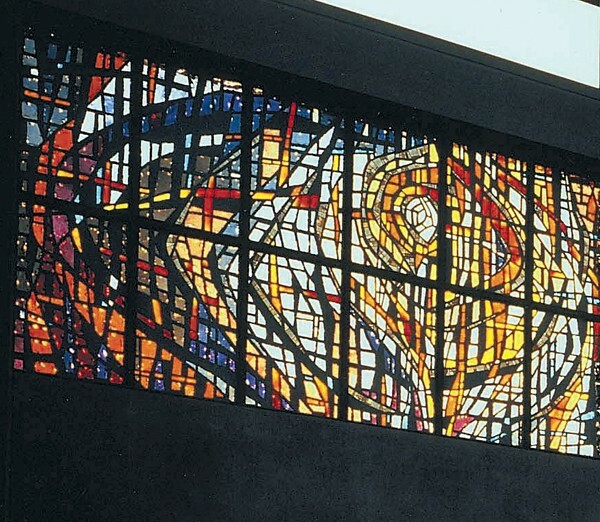 French artists in the 1930s revitalized the ancient techniques as they sought a style of stained glass that would complement the architecture of the mid-twentieth century. CSS’s Bernard O. Gruenke, Sr., after discovering the thick, dalle de verre glass in France in 1949, became a proponent of the faceted technique for installation in new churches. 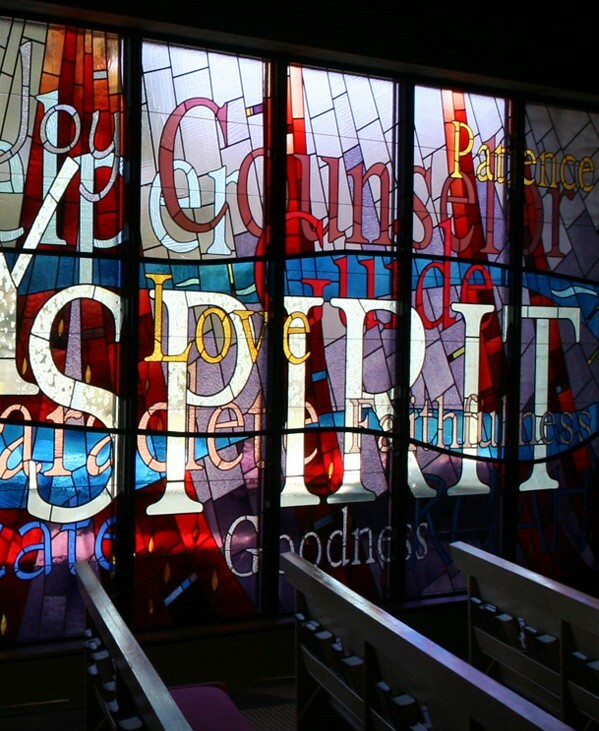 A faceted glass commission is conducted similarly to a stained glass project. However, the matrix supporting the faceted glass is created with epoxy coated in finely crushed stone aggregate. CSS has pioneered a two-cast epoxy process that improves upon the earlier concrete casting. Faceted glass can be very heavy, approximately eight pounds per square foot, thus adequate reinforcement is essential. Proper framing is also important, and can be executed by the Studio. The addition of safety laminate storm glass on the exterior is advisable for faceted glass and may soon be required by building codes. CSS recommends installing safety glass with vented air chambers to prevent a build-up of heat and moisture that can damage art glass windows and window frames. The unique appearance of faceted glass makes it eye-catching. Each of these windows is an enduring installation that brings brilliant color and unique design to its environment. 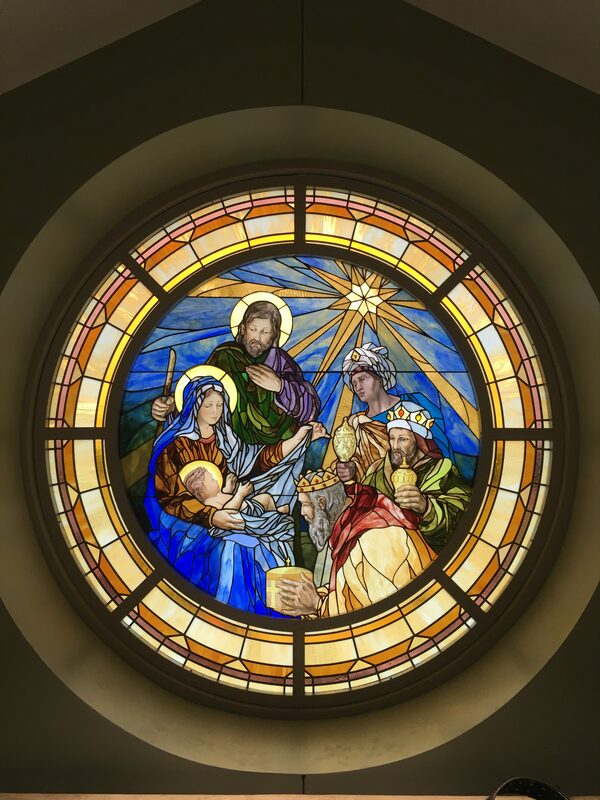 Protective glazing, or storm glass, is a good way to safeguard stained glass artwork if the windows are at risk for breakage due to vandalism or severe weather conditions. Cumulative damage from precipitation, sunlight, and temperature fluctuations can be reduced by properly installed and vented protective glazing. The worst problem with much existing storm glass is the lack of venting. 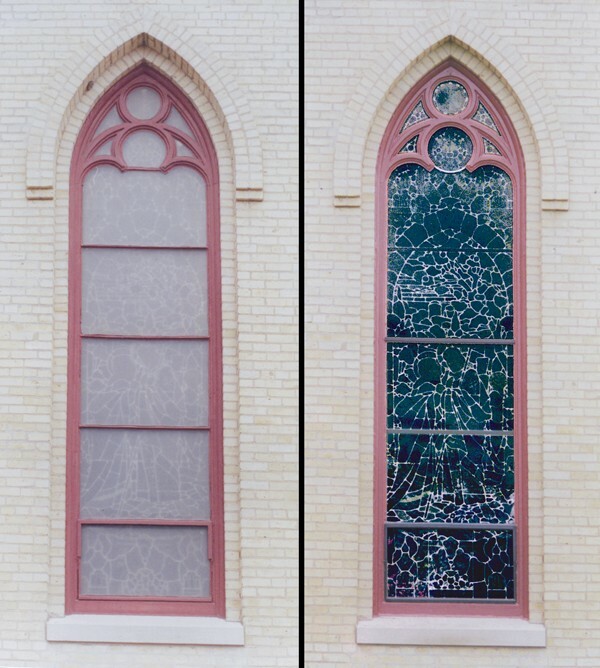 Unvented storm glazing allows heat and moisture to build up between the stained glass and the protective glass, contributing to lead corrosion, glass breakage and frame deterioration. 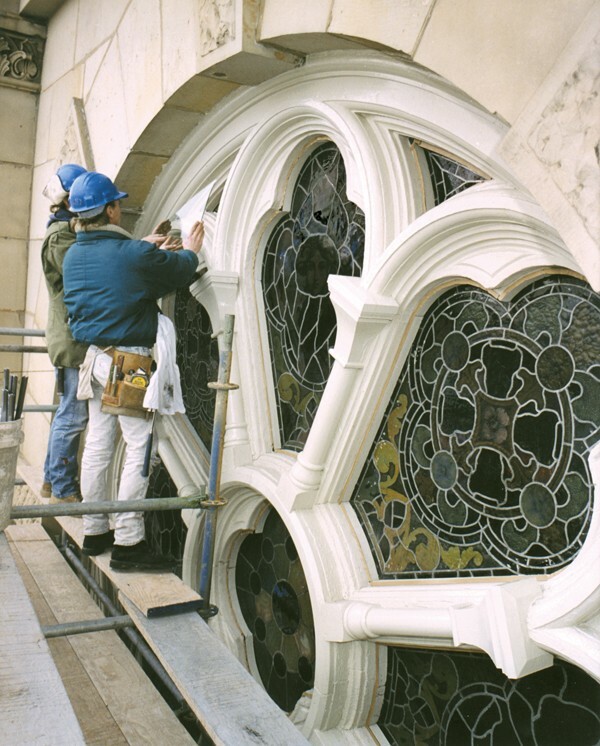 Removing the existing protective glazing allows for the installation of vents, the maintenance of the exterior of the stained glass frames and the resealing of the glazing. Some protective glazing distracts from the stained glass on the interior and looks unattractive from the exterior. Storm glazing by CSS is custom-designed to be as invisible as possible using the following methods: reducing the number of horizontal framing lines (which also reduces the risk of leakage); modifying joints to follow the lead lines rather than compete with them; painting T-bars and/or vent frames a dark color, visually reducing them. Safety laminate glass is used by CSS for protective glazing. This polycarbonate sandwiched between panes of glass offers strength without the risk of yellowing; it is as attractive as normal window glass. However, if the original had a certain color or texture, CSS can provide custom laminating to match. Modify or replace any storm glass that is not vented. Replace protective glazing that covers the exterior of a historic frame. Set the storm glazing into the original frames, along with the stained glass. Repair or replacement damaged wood in the frame, including deteriorated window sills. Use safety laminate glass for protective glazing, rather than glass alone, which may not offer enough protection, and rather than plastics such as Lexan, which often discolor within a few years. In areas that require hurricane protection, use hurricane storm glass certified for code approval. There are economic benefits to ordering protective glazing and stained glass restoration at the same time. Because storm glass is custom-cut to fit the frame, creating it without the stained glass to use as a template is more time-consuming. Labor time is also saved by removing existing protective glazing, if any, at the same time the restored stained glass and the new storm glass are re-installed. This efficiency also brings savings due to the reduced number of scaffolding erections. The Conrad Schmitt Studios is proud of its history and maintains its goal of longevity in every creation. Whether working directly with the client or through an architect or designer, the Conrad Schmitt Studios is an effective member of the restoration team. The Studio will continue to strive for excellence through the quality of its art.